Health and wellness are key components of a rich life. You only have to lose them for a day to realize how precious they are. On the Saturday of Thanksgiving weekend, I successfully finished the Quad Dipsea (roughly 29 miles and 9300 vertical feet of climbing) in 5 1/2 hours placing me at 29th out of a field of 250. The feeling of joy and sense of accomplishment as I crested the final hill and knew I was going to finish almost brought tears to my eyes and will be with me for a long time. An unlike a road marathon, I was walking well the next day, and headed out for a little trot on Monday to stretch out the legs. This is the first ultra I’ve run since Way Too Cool 50k in 2003 and I wanted to share a few tips on how I pulled this off with a 12 week training program including only 3 cardio training sessions per week. For those of us who want to take on a significant athletic challenge but have families and careers, I thought it’d be helpful to know you can do it. For the last 10 years, I’ve been nursing temperamental knees, ankles, plantar fascitis, achilles tendons and hamstrings, yet somehow managed to avoid surgery or stopping running altogether, so several of the tips pertain to preventative maintenance which becomes more important as our bodies age and tighten. The human body gets stronger through a process of increased intensity followed by rest. This is why they don’t climb Everest in one shot, but go up and down between the base camps getting used to progressively higher altitudes. What this means for a training program is don’t build from your base to the max in a continuous line, but add a little, maintain, and then back off, before building again. For a 12 week training period this would mean breaking it up into 3 x 4 week periods each containing 2 Medium, 1 Hard, and 1 Easy week. 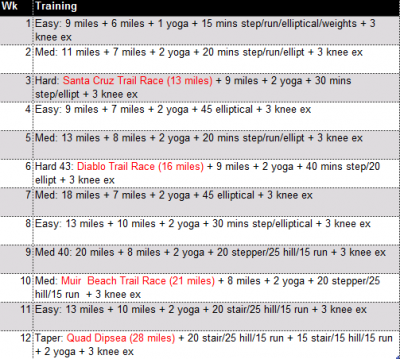 You can see my training plan on the left, and read an explanation of the key components in following sections. The great benefit of this is you can typically take it really easy in the Easy week following a Hard week if you push it too hard and some body part gets aggravated (quite likely on an accelerated training program like this). Also, its much easier on the mind to break down the challenge of the 12 weeks as 3 manageable chunks each of 4 weeks. Time Commit: Build from 2.5 to 5 hours per week. If you can finish a long run at 2/3 – 3/4 of your ultra (I built up to 21 miles for a 29 mile ultra), you can finish your ultra. Long runs give you confidence. Once you start going over 2 1/2 hours, you use up all the carbohydrate (glycogen) stores in your body and the body starts to turn fat into energy. This is typically associated with “hitting the wall” in a marathon (the point in time at which your body turns to fat as a fuel source). You’ll need to train yourself to keep running when you reach this point to successfully run an ultra. You can practice using different nutrition and pieces of equipment to find what works. What are you going to eat and drink, when to provide rehydration and energy without causing nausea or cramping? How are you going to carry all this stuff ? Do you need to lubricate certain areas to prevent chafing? What socks and shoes won’t cause blisters? I highly recommend training on terrain as similar as possible to the ultra, at race pace (more on this later). Find some beautiful trails close to home that you can enjoy running on. After long runs, take a 10-15 minute ice bath (I’ve had good success with just cold water), very unpleasant on entry, but brilliant for recovery. This is the most intensive time sink on the weekends, so start as early as possible to minimize the impact on family time, negotiate in advance with any significant others for the time, and find some interesting podcasts to listen too (I’ve enjoyed learning French with Coffee Break French, listening to Free by Chris Anderson and Triibes by Seth Godin (both free downloads), TED talks, iinovate, and the Economist). Time Commit: Build from 1.5 hours per week. If you’re doing an ultra with a lot of climbing, stair climbing sessions are a necessary evil. My “favorite” 1 hour workout combined 20 minutes of stair climbing with approx 25 minutes of walking at 4mph on a 15% slope, finishing with a couple of miles at a fast clip. Fast walking uphill when tired is an extremely useful skill in ultras as is getting used to the transition from walking to running when you crest a hill. If you substitute elliptical or bike for the run at the end, you have a low impact workout. Time Commit: Build from 1 – 2 hours per week. Don’t add miles for the sake of it. 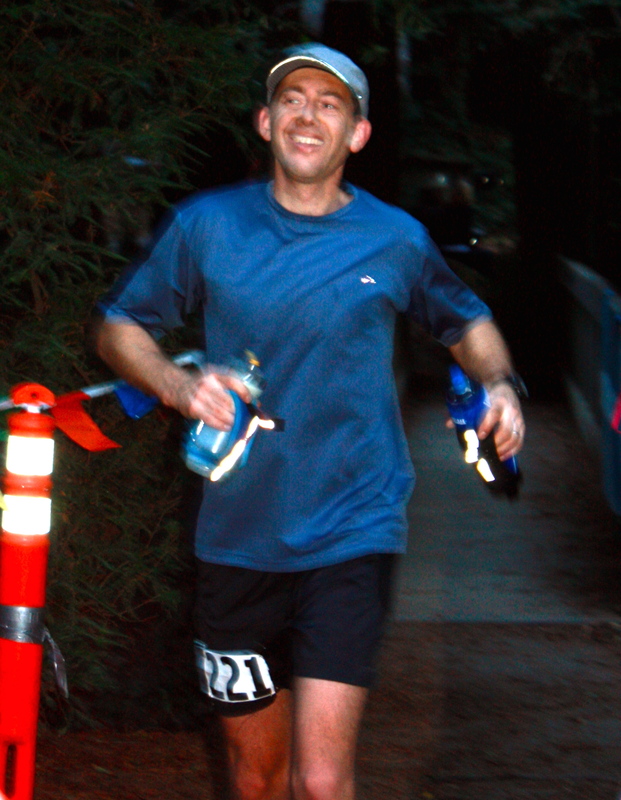 But a second run is good conditioning for the legs (at the end of the day the best training for running is running). If cardiovascular endurance is your main challenge and the musculature is strong, add more runs. If you’re worried about injuries, use elliptical or bike to add endurance. The bike is great at the gym because it’s so easy to read while you’re on it (use a HR monitor until you know what level to ride at), and out on the roads for building quad strength climbing hills. There’s nothing quite like an organized run to get the competitive juices flowing. I’m a big fan of the runs put on by Pacific Trails. They’ve found the most fabulous scenic and hilly trails in the Bay Area, they have about 25 events per year, each one offering distances from 10k to 50k they’re great hosts and very well organized with clearly marked trails and well-stocked aid stations. And they know the ultra community so well, so you can learn anything you need to. One of the key things to do in races is to learn how hard you can go without blowing up. Its good to get on the wrong side of the line a few times for the conditioning effect and reminder of how humbling that can be. The other key component is getting your nutrition right because its under stress that things start coming undone – especially dehydration, cramps and nausea. I nearly blew the Quad via nausea by taking watermelon with salt at the first Stinson Beach turnaround because they had no potatoes. So use the trail races – about 1/month to work out what works (and, more importantly, what doesn’t). I’ve got to believe most people have a long list of items to watch on their Tivo/DVR. So its just something productive to do when you’d otherwise be completely immobile on the couch. Using a foam roller will really help to break down scar tissue forming on your legs. Roll until you find a sore spot, hold for 20 seconds, roll to the next spot. Then stretch out problem areas – nice long gentle stretches of up to 2 minutes duration without bouncing (believe it or not, stretching improves through relaxing, not forcing the muscles). If you’ve got a few strengthening exercises (squats, 1-legged squats, leg raises, crab walks, etc) from your physical therapist or chiropractor now is the time to do them. A few sit-ups, planks, crunches, and back extensions are good if you’re not doing any yoga. Then strap an ice pack on to the tender areas (in my case, knees) for 10-15 minutes. You should ideally roll and stretch before exercising. This is the most critical piece of advice I can give. From bitter experience, if you go out too hard, you’ll most likely blow up. Back off, enjoy the beautiful scenery and if you feel good later, pick up the pace. If I go out too hard, (typically characterized by getting anaerobic on the first couple of hills) I typically get severe cramping after 2.5 hours, no matter how many salt tablets and/or water I take or stretches I do. If I back off 5-10%, the cramps don’t happen. In the Quad I ran the Double in 2:37 vs. my personal best of 2:27. Those 10 minutes made all the difference in the world. I had to consciously keep reminding myself to slow down on that first leg – coming into Stinson Beach the first time I just felt fantastic. I hope this experience will provide some guidance and inspiration for others. You really can make this happen off a pretty small base (say 3 days of cardio a week with an 8 mile long run) even with less than perfect knees. Life should be a rich and wonderful journey.